Am Sonntag, 20.5.2007 gibts wieder ein Permanent Breakfast am Stiftsplatz. Wie letztes Jahr gibt es auch dieses Jahr wieder ein Permanentes Breakfast: das immerwährende Frühstück. Immerwährend sind inzwischen elf Jahre, im Mai 1996 initiierte der Wiener Künstler Friedemann Derschmidt und seine Gruppe das “Permanent Breakfast”. Die Regeln sind einfach: einer lädt zum Frühstück ein, alle eingeladenen Freunde bekommen ein ordentliches Frühstück im öffentlichen Raum. Am folgenden Tag frühstücken die eingeladenen und laden wiederum Freunde ein, die Kette setzt sich fort. Jedes Jahr gibt es üblicherweise Startfrühstücke am ersten Mai. Organisiert wird das Startfrühstück von digitalen Kulturtreibenden in Kaiserslautern. Am ersten Mai wird ab 11.00 Uhr am Stiftsplatz gefrühstückt. Das hat zwar nichts mit digitaler Kultur zu tun, wird aber sehr viel Spaß bringen. Bitte beachten: es ist sehr wahrscheinlich, dass alle Geschäfte und Bäcker zu haben, also entsprechend vorsorgen. Bei Regenwetter? Als Kontaktmann für die Frage was bei Regen passiert dient Leo. Ruft mich einfach an: +49 176 24548974. Last weekend we had the fourth Semantic Desktop Hands-On Workshop, this time again in Berlin. There were about 25 participants from the whole world, people from various open source Semantic Web projects, employees of companies, interested friends, professional consultants, and semantic web evangelists. All were practioners, all anticipate using the semantic web. Nothing could possibly go wrong, and it turned out to be a great success. We had three days of intensive discussions, code hacking, demos, talks, talks, talks, and a special social event on each day. At the end, everybody was just exhausted and we had a wrapup session in the Bebop-Bar, discussing about the future of the Semantic Web until 03:00. Here is a small video I hacked together using photos from our semantic desktop hack flickr pool. Kudos to Michael Sintek for pointing me to this roadmap. Davor from the Center for knowledge transfer in information technologies/Jozef Stefan Institute wrote an e-mail, pointing to the videos of the ISWC and ESWC conferences. This institution recorded all talks at these conferences and put them online, a valuable resource if you are interested in Semantic Web. Marian Bantjes blogged a year ago about the art of heraldic banner design. First of all: I want such a banner, darn that I don’t carry my shield with me every day. Perhaps the back of my Laptop will also do. Second, this aint no bad way of annotation. “…Corporate logos are most often completely meaningless, or they try to portray something quite complex without having a language to express it. I can only copy that, apart for my admiration for Tim Berners-Lee, this video has some very nice things to remember. Tim has the vision, he had all the ideas in the first place and he is professional enough to have no problem repeating himself, explaining the semantic web again and again. The web in the first place was something which solved a particular frustration I had, it scratched an itch that ….we would make life a whole lotta easier. The web of data, Semantic Web, same thing, frustration that I cannot pull that data and pull that other data and connect them. … How do these publication fit in with these events. … Where is the nearest coffee place to that friend I want to take out for lunch. The video was done by the technology review, an interview. It only features Tim, no commentary nor questions. We see the success of the web 2.0 buzzword everywhere, now we face the web 3.0 buzzword not exactly convinced who coins it and what it means. 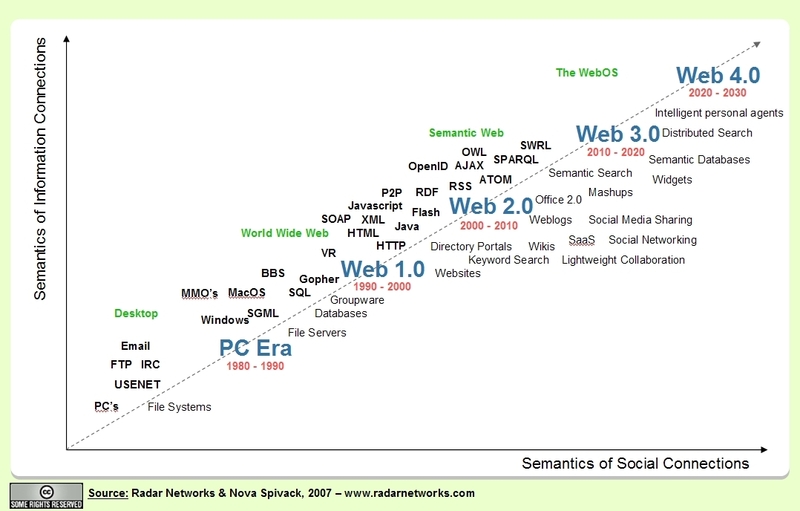 I will give my opinion on what the future is, namely the Semantic Web 2.0. A semantic web with the usability and round corners of the web 2.0, and a web 2.0 with the fantastic data integration features of the Semantic Web. Tim O Reilly can be thanked for investing his time and his companies’ resources into the web 2.0 buzzword: its good for everyone. Finally we know what we like about the web, if you don’t know it yet, always read the original first. Given this great success, namely that web 2.0 and its description really fit so well the reality we face in the web, people want to ride on with buzzwording and predicting the future. I happily join. Today again I got an e-mail mentioning and advertising the web 3.0, which will, let me assure you, be the next big thing. Increasing the number by one and saying its the next big thing is the right approach, but it can be taken by so many. What we can’t copy is the fact that Tim O Reilly stated the obvious, was able to describe the existing facts in words that caught. Web 2.0 is a way of asserting ourselves what we do, giving us the satisfaction of undestanding why google, napster, flickr, bittorrent, etc are such successfull enterprises. So, coming to web 3.0, what is it? At DFKI we have written a paper about web 3.0 being the convergence of web 2.0 and Semantic Web. The e-mail from semantic web school I got today goes into the same direction. And there is this NYT article on web 3.0, that you can google now for yourself. Its all in the semantics, and with semantics we hope: Semantic Web. But who says that this is the final view on web 3.0? Any C-Blogger can invent this word, or make a new one, and you can search for web 2.5, web 1.0, web 0.0, web 10.0, web 2007.0, or whatever comes to your mind, its an open field of invention, only limited by the amount of floating point numbers, which are, lucky C-Bloggers, infinite. re needed that see how data integration using Semantic Web technology can save a customer money and time. On the other hand, web 2.0 companies “be nice” but are usually working under capitalistic constraints, if not filling their own pockets, at least the shareholders’. A key in business is now to be open to data integration, like RSS feeds or Web APIs that allow you to manipulate your flickr photos, or the classical google maps API that we find useful everywhere. The problem here is, that if you have a running system, never change it. The APIs are based on XML, and simple HTTP calls (REST). Why bother upgrading to Semantic Web? etc etc. you now know enough to go on yourself.